As I delved further into the matter, both fascinated and intimidated by the prospect of venturing into unfamiliar scholarly territory, I realized that the very nature of my project had to change if I hoped to give a full and proper account of the work’s significance. What I originally envisioned as a fairly simple translation-and-introductory-essay project turned into a full historical investigation into the development of a set of cultural and historical myths surrounding The Story of Hong Gildong, including the myth of its authorship, the myth of its status as the first work of fiction written in the native Korean script of hangeul, the myth of the radical political message of the narrative, and the myth of its protest against the Joseon dynasty’s policy on the status of secondary offspring. 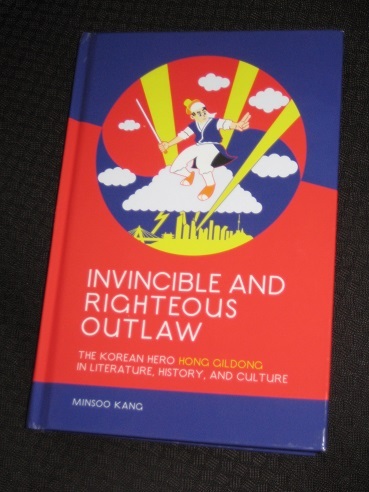 Instead, he set to work on a full-length investigation of the truths and myths, with Invincible and Righteous Outlaw: The Korean Hero Hong Gildong in Literature, History, and Culture (review copy courtesy of University of Hawai’i Press) the result. The Story of Hong Gildong, for those who haven’t read it (more fool you) is a short, three-part story relating the adventures of a man often described as the Korean Robin Hood (with magic…). The son of his father’s concubine, Gildong’s origins mean he’s unable to achieve great rank, so he eventually leaves his home to make his mark in the world in a very different way. Having taken the leadership of the Hwalbindang, his very own Merry Men, he causes havoc all over the kingdom until he eventually allows the King some peace and flies off to a distant island where he founds his own kingdom. It’s an excellent story – just don’t expect any realist touches. Kang’s issues concern the provenance of the text, with the standard line being that politician and writer Heo Gyun wrote the book near the start of the seventeenth century. The story was said to be based on a real-life bandit figure, and most Koreans will tell you that it was the first novel written in the native script, rather than Chinese characters. However, there’s a slight problem with all this, namely that these are all claims based on rather flimsy evidence. Kang is actually a historian, and he devotes the first part of Invincible and Righteous Outlaw to examining and debunking the claims around Heo’s authorship. Carefully exploring the evidence, he shows how much of the ‘proof’ rests on one or two unsubstantiated claims, in particular those made by the 1930s literary critic Kim Taejun in his History of Joseon Fiction. Kim’s unresearched opinions were then amplified in a literary echo chamber, creating a myth even greater than the story of Hong Gildong itself. This leads to changes to the story, both in literary and cinematic versions. During the colonial period, for example, there’s a rather downbeat ending reflecting the depression of an era of subjugation, with our hero sacrificing himself to save his mother’s life. Meanwhile, a North Korean movie changes the finale even more radically, with the culmination of the story involving a battle against Japanese ninjas – akin to Robin Hood taking on German soldiers! Kang also casts his eye over an array of adaptations, such as stories and novels (including one by Yi Munyol) that play with the tale rather than adopting it. Here, modern characters reflect on the idea of Hong Gildong, especially the concept of a cunning, streetwise rebel, in a modern setting. The book closes with a look at more versions of the tale, with examples of animated movies, multiple drama series and even a dispute over the rights to the hero’s image. By the end of Invincible and Righteous Outlaw, the reader is forced to concede that Gildong is a very popular figure in his homeland, and certainly worth the interest Kang has taken in him. I enjoyed Invincible and Righteous Outlaw immensely, especially for its fascinating look at the textual history. Kang explains the variety of extant copies of the text, taking us through a literary detective story, and the survey of the many adaptations was also a highlight. There are several books and dramas (not to mention the movie with the ninjas!) that I’d love to track down. While some might find the focus on Korean history a little dry at times, it was a compelling look into the period discussed, and I enjoyed learning more about the context of the story. However, it could be argued that the focus on the history, in particular the frequent returns to Heo Gyun, was at times detrimental to the flow of the work. Like Gergana Ivanova’s Unbinding the Pillow Book, Invincible and Righteous Outlaw is very good at explaining what the book isn’t, but less adept at saying what it is. The third chapter seems to be building up to this with its use of textual analysis to compare plot features and thus date the original The Story of Hong Gildong, yet all too soon we’re back to Heo Gyun instead. This isn’t exactly Kang’s fault (if Korean experts don’t really know who wrote the book and when, there’s little he can do about it), but it is a little frustrating for the reader wanting to know more about the origins of the story.